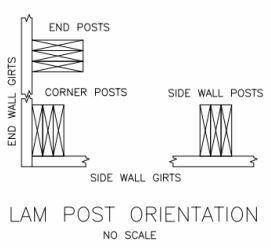 There are a number of factors that determine the size of the posts you use on your building. 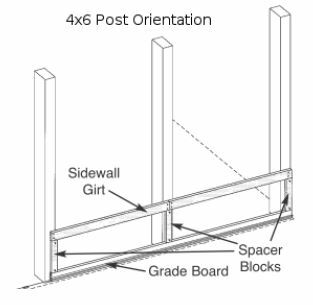 Wall height, building span, wall length, and wind conditions are typical considerations. Attic trusses, or floor joists create loads that may require larger posts, glulams, or closer post spacing. 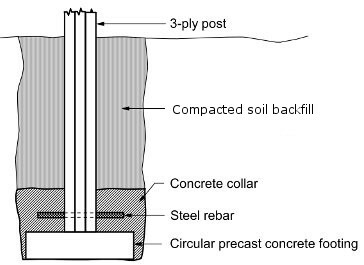 Post foundation embedment is determined by soil bearing capacity and frost heave. Our footer size calculator is useful for calculating the amount of concrete required for each post. 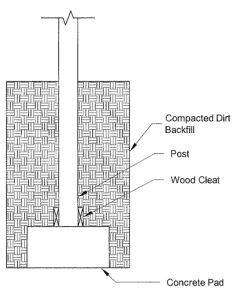 Northern climates mean deeper pole embedment to combat frost heave. Frost heave creates an upward thrust or deforming of the soil near the grade and below grade up to several feet. Soil that consists of clay or silt does not have the load bearing capacity of sandy, gravel and rocky soil. It is always a good idea to check with local authorities about soil consistency in your county. Some areas have very consistent soil while others fluctuate wildly. 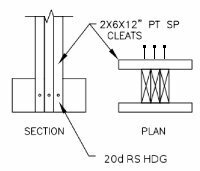 Uplift cleats consist of treated wood cut 12" long and nailed to the bottom of the post with 3 20d (4") galvanized ring shank nails.